Peptide antibodies are particularly useful for immunocytochemistry (ICC) and immunohistochemistry (IHC), where antigens may denature due to fixation of tissues and cells. 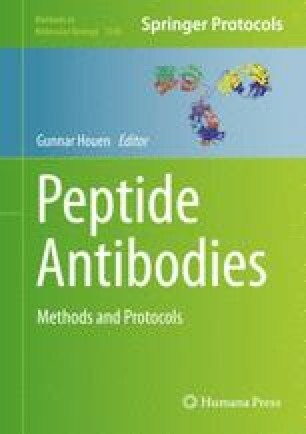 Peptide antibodies can be made to any defined sequence, including unknown putative proteins and posttranslationally modified sequences. Moreover, the availability of large amounts of the antigen (peptide) allows inhibition/adsorption controls, which are important in ICC/IHC, due to the many possibilities for false-positive reactions caused by immunoglobulin Fc receptors, nonspecific reactions, and cross-reactivity of primary and secondary antibodies with other antigens and endogenous immunoglobulins, respectively. Here, simple protocols for ICC and IHC are described together with recommendations for appropriate controls.